Homepage. This page: An invoice issued by a 'Motor Works' based in the South West of England. This piece of motorcar-related paperwork dates to 1921, so pre-dates many of the other motoring bits and pieces that feature on oldclassiccar. 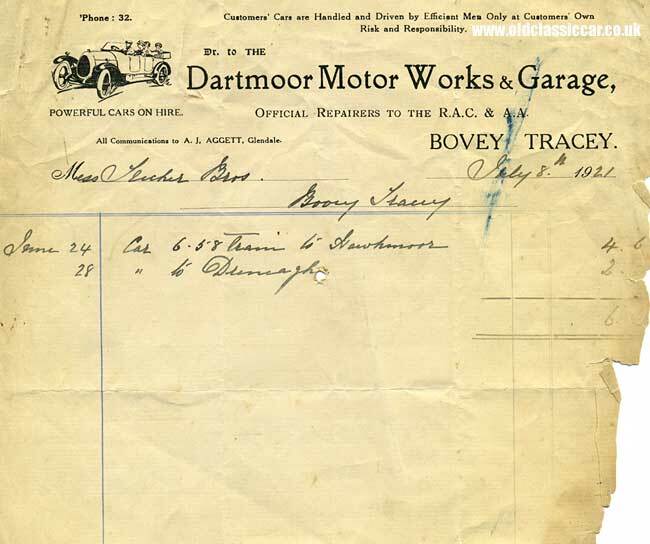 It was issued by the Dartmoor Motor Works & Garage, of Bovey Tracey (much of the car ephemera that I've featured on the website came from this area), dated July 8th 1921. The fact that their phone number was just '32' gives a real feeling of how different life was back then, and the language used is different to that which you'd get today .. "Customer's Cars are Handled and Driven by Efficient Men Only at Customer's Own Risk and Responsibility". They were official approved repairers to both the RAC and AA motoring organisations, both still in their infancy really. The illustration shows a vintage touring car powering along with a full complement of passengers onboard. I'm always keen to add to my collection of vintage motoring snippets like this, so if you have anything that you'd be willing to part with, or scan and email over, I'd like to hear from you via the contact page.